Tailwind was brought to my attention by Hootsuite who have cleverly integrated it into their dashboard. One assumes that Hootsuite won’t – not yet – be offering a Pinterest scheduling system of their own as this is what Tailwind offers. 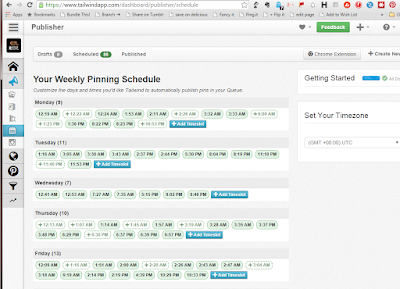 Tailwind’s free account lets you schedule up to 100 pins for Pinterest each month. You can do that in a batch or as you go. The key thing is to get their browser button installed so you can press it on the right page, open up their large pop-up window and select the images you want to share. The first thing that I saw and liked was their attempt at a weekly pinning schedule. 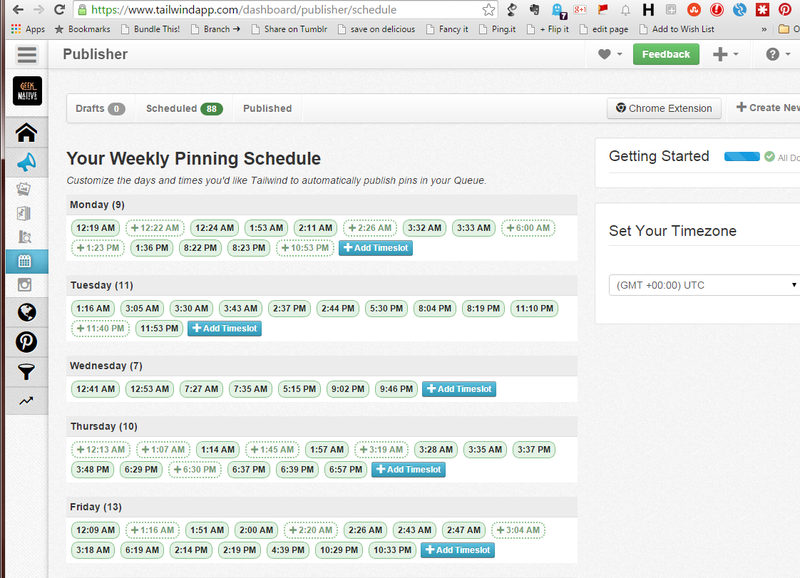 Each day as some recommended times to pin – in light green dots (in contrast to the green shade of slots you’re using). The times are based on when people are engaging with your Pins. As it happens; this compares very well to Hootsuite who seem to struggle with the notion your audience might be international and you’ll want your updates spread out across the full 24 hours as a result. The next feature that caught my eye was their ability to schedule a lot of pins and do it quickly. One of my geeky blogs likes to share galleries of art. I have to pin each one by hand (and hope it doesn’t flood my audience). With Tailwind you press that magic browser button of theirs, open the pop-up and just click on the images you want to share. 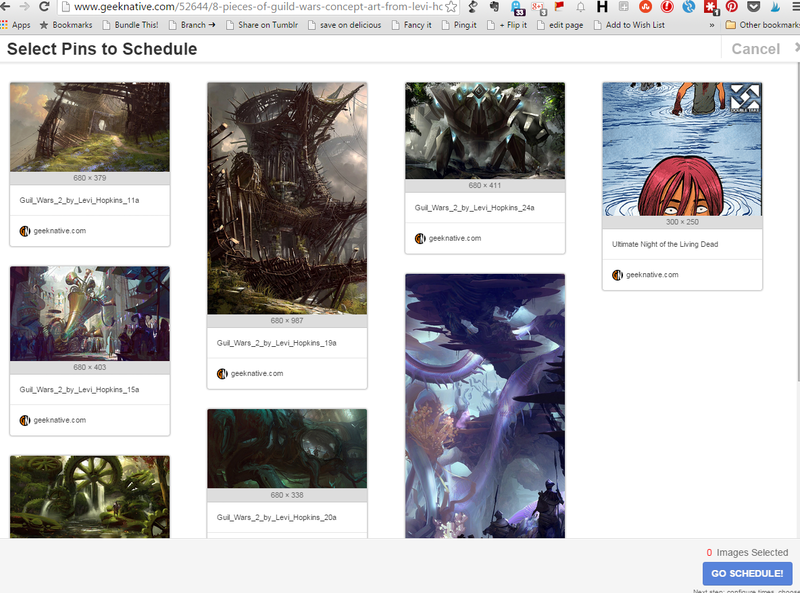 Hit “Go Schedule” and you’ve a quick way to assign them all, at once, to a board (or one at a time) and then drop them all, at once, into your post schedule. Given that the post schedule on Tailwind is impressive this easy to schedule a whole bunch at once is especially nice. I very quickly decided to go pro. It’s $9.99 a month for bloggers and small businesses if you pay for a year at a time, or $15 if you don’t, and that compares well to something like Rafflecopter. The benefit of going pro is better analytics and unlimited pins. 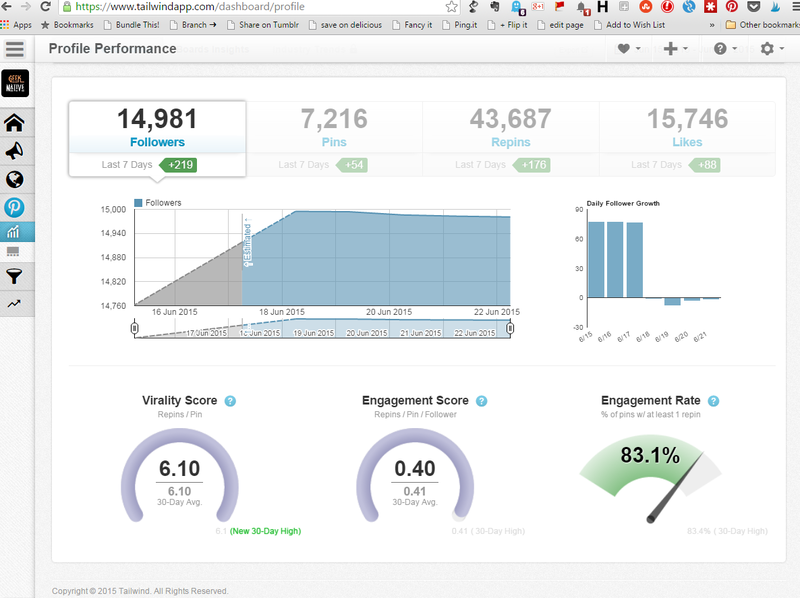 I’ve seen some awful dashboards in my time but Tailwind gets it right. At a glance I see whether my repins are better or worse than last month, how my pin total is doing compared to last month and the same for my followers. With 14,981 total followers your account is looking great! You've been gaining about 414 new followers per week recently, so this past week was below average. A profile performance dashboard helps me see whether or not my pins are engaging followers at the same level. I had thought there was a Pinterest purge going on – as my follower count was dropping – and Tailwind has helped confirm this. I can see my pins are engaging, I can see that the new followers are coming in too but that the account is losing even more. I hope that’s an account purge rather than loads of Pinterest followers dumping my boards. I’ve found it rather useful being able to search through the 7,000 or so pins I’ve already uploaded to see what’s popular. In this case; Star Wars is. I should do more Star Wars content. There’s a loyalty program too; a system which lets me grant a free month to a contact for them to test. The goal, they say, is to help Tailwind grow and I suspect that won’t be a problem. What I miss out on for not being an Enterprise client is trends and big data analysis. I can’t see what other geeky Pinterest users are getting to work for them. That said; as a solo-user I’m pretty sure I can deduce it. If I had my agency hat on I might need some supporting evidence but as a blogger I can go with my gut feeling. My biggest success with Pinterest came when I just happened to spot some fresh, quality, original content appear on my homepage as an artist shared it. I was able to blog it, compiling the pieces into a single post and share it first. It would be nice if Tailwind helped identify “never seen before” content and had an alert system for me.